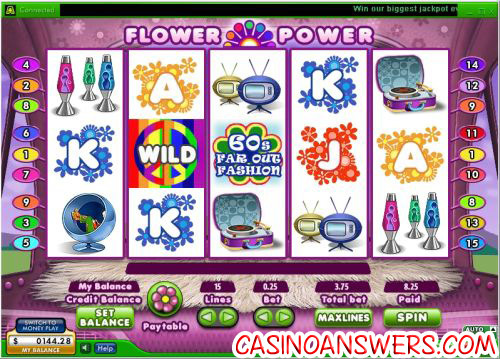 Flower Power Video Slot Guide & Review - Casino Answers! Flower Power is a 5-reel, 15-line video slot developed by Random Logic, featuring a wild symbol, a free spins feature and a bonus game. You can play the Flower Power video slot game at Supro Casino and Littlewoods Casino. The highest paying symbol on the Flower Power video slot is the Rainbow Peace Sign symbol. If you hit 5 of these Peace Sign symbols, you will win the 3000 coin top jackpot on Flower Power. The Peace symbol is wild and will substitute for all symbols in Flower Power except for the scatter and bonus symbols. Another high paying symbol on Flower Power is the Volkswagen Bus symbol, which pays up to 1500 coins. The Scattered Heart symbol does not pay out by itself, but if you hit the symbol on reels 1 and 5 at the same time, you will be awarded 15 free spins. Free spins will play at the same number of active paylines and bet per line as the triggering spin. All prizes, including additional free spins (which can will be accumulated to the existing one), infinitely, can be won during free spins. You can use Flower Power’s free spin feature to win big at Supro Casino! 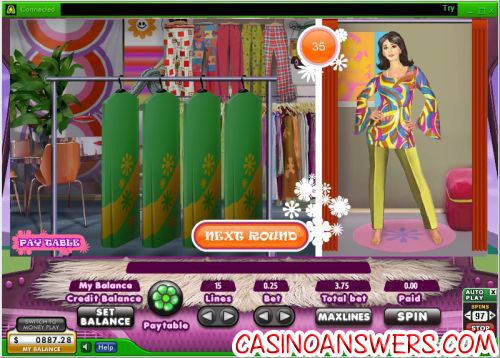 All symbols pay left to right on consecutive reels of an active payline, except the scatter and bonus symbols. All wins are multiplied by bet per line. Scatter and bonus wins are paid in addition to payline wins. Only the highest win is paid on each of the active paylines. If you enjoy the hippie sub-culture, Random Logic has put together an excellent representation of it in video slot form. Flower Power has great art and lots of music and sound effects to go along with its theme. The free spins feature lacks a multiplier and the bonus game is simply a “pick ’em” game, but those are minor complaints at most. To try the Flower Power video slot out, please sign up and make your deposit today at Supro Casino! Are USA players able to play the Flower Power video slot for real money? Unfortunately, players located in the United States of America are not currently able to play the Flower Power online slot machine for real money. Luckily, there is an excellent alternative in the Psychedelic Sixties iSlot that you can play at Vegas Days Casino.